about listening to the gospel and letters of John in Greek? Mr. Buth, I appreciate your concern to promote biblical languages skills. I want to ask something. I am intending to specialize in New Testament. How helpful do you think it will be if I am going to study modern Greek for a year in Greece? Your question needs many pieces for an answer. Since you asked 'how helpful' I will try to rank it with other options. Maybe more surprisingly, if I had to choose between fluency in modern Greek or modern Hebrew for New Testament studies, I would choose modern Hebrew. The cultural background to the gospels and New Testament is Jewish and Hebrew is the window into the sources. Dead Sea scrolls and rabbinic literature require a fluent level of Hebrew to make the best applications to the Greek Testament. Thirdly, in a choice between concentrating on developing modern Greek fluency versus Koine, I would choose Koine. They are distinct enough in their morphology and syntax to require separate learning. By comparison, 100% of modern Hebrew morphology transfers to biblical Hebrew. However, fourthly, learning modern Greek fluently is much easier and it is more accessible. It would be a great base for studying the rest of the language. A year in Greece would provide a solid base if one stays away from English speakers. Fifthly, a person needs to set the above skills as as achievalbe goals and then work towards them. The biggest loss comes from students who get PhDs without being fluent in any of the biblical languages or related dialects/languages. Then they are saddled with responsibilities and jobs, without time to pursue these languages, though they may finally realize that their training skipped over some foundational skills that are taken for granted when studying most other literatures. That is what needs to change for the next generation and what the Biblical Language Center has dedicated itself to helping. PS: I love visiting Greece, the music, food, sea, and friendly reception by locals. The last time I was there I spoke only Koine for two weeks and was both humored and encouraged by the locals. Their typical response was 'bravo'. Equivalent to what we say in Hebrew כל הכבוד. Thank you very much for your reply Mr. Buth, actually I am willing to continue my study in an MA in NT, but the study will start a year after, so I would have an "empty year." And I want to make it effective. I've browsed the one-year modern hebrew course in Hebrew University Jerusalem and found it quite expensive. Then I found the School of Modern Greek Language in Aristotle University of Thessaloniki and the costs is good. I've looked at your biblical ulpan page and found it interesting. But it's just a short-term program and it's more expensive than Thessaloniki. Do you have any suggestion for me? If you can get a year in Thessaloniki, that would be great. On Hebrew, that may also depend on visas and what country you would apply from. Hebrew University offers scholarships, but they are usually funded by "Friends of Hebrew U" associations from the home country. The Israeli Foreign Ministry also has occasional scholarships, and I know one person who completed a Biblical Hebrew MA with such funding. If you are fairly independent you could also consider one of the government "ulpans". For beginning Hebrew these can be as good or better than the University because of the focus on rapid acquistion of functional speaking skills, especially levels 1-4. At levels 5-6 the University is better because of a focus on training a student to be able to write university level research papers. For an ulpan one would visit as a tourist and enroll in a local ulpan for immigrants. These schools are typically under $200/month, but they vary. Housing is not provided, a student must set up a living situation on their own. Thanks for the advice. I have just thought about it. What do you think if I spend a semester in Israel and a semester in Greece? Thanks for bothering. Why not a year in both? The reasons are: (1)I just have a year. (2)The costs would be too much. By the way, mr. Buth, since you recommend me to study in Jerusalem, what do you think about studying NT in Jerusalem, such as HUJ? Hebrew University is an excellent place for NT if you have the maturity and independence for such a program. You will develop a high level of Hebrew far above what you would develop elsewhere and you will have the opportunity for broad and in-depth studies in the cultural background to the NT. There are some courses offered that are focussed directly on the NT, and these may be supplemented with courses at the Ecole Biblique and at the University of the Holy Land. 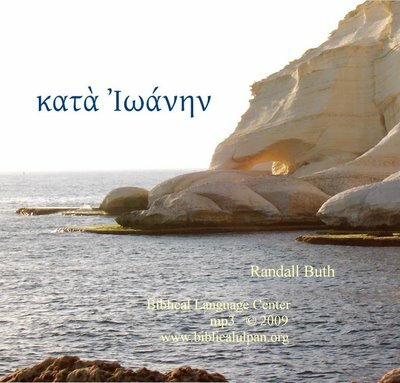 Finally, you will be in the one city in the world where a group of people are seriously trying to learn to speak and internalize ancient Greek. See the next blog item here, more recent than this item. See biblicalulpan.org for more information. Of course, you can't do it all in one year. I found that HUJ is quite expensive, UHL cheaper, and Ecole Biblique is the cheapest. The problem with Ecole Biblique is, as far as I know, the courses are conducted in French. Could you give more picture about other schools than HUJ such as UHL or the Ecole? I saw your CV and it's written that you were a UHL graduate.